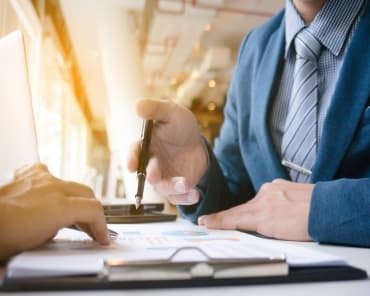 IRS settlment is also known as the “offer in compromise” (OIC) and it’s available to virtually anyone who owes the IRS back taxes. The idea is to settle with the IRS for less than what you owe. The IRS forgives the rest. The offer in compromise is a life saver for many of our clients, but it’s not for everyone. As you’ll learn in this chapter, the vast majority of our clients are “success stories” because we solve their tax problems using a variety of methods, not just the offer in compromise. Considering all IRS solutions is critically important if you want to put your tax problems behind you, once and for all. 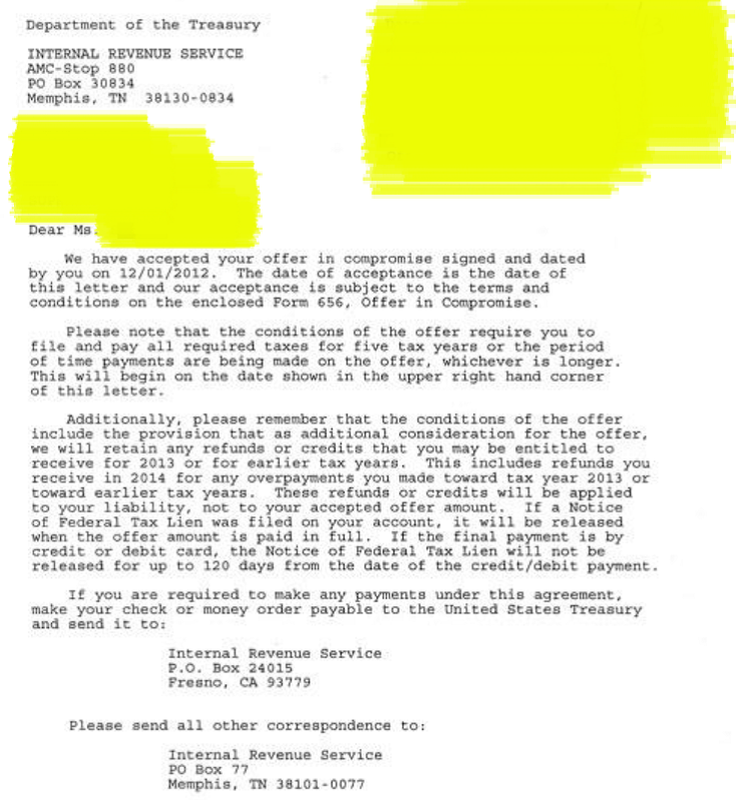 Getting the IRS to accept an offer in compromise requires knowing whether, based on your unique situation, you have a reasonable chance of success if the offer is submitted. When we sit down with a client, we analyze their financial situation, and we can determine if there is a reasonable opportunity for success. To the right you can see an example of IRS accepting one our clients' offers. We won’t submit the offer unless we believe it will succeed. The good news is that if an offer in compromise is not for you, alternative solutions may actually benefit you more. It’s like knowing whether you have a good chance to win a football game before you play the game! Why waste time and money putting you in a program doomed to fail? Unfortunately, “tax resolution” companies sell vulnerable citizens on tax programs doomed to fail, but they couldn’t care less. The scammers get their fee and that’s all that matters to them. Yet the citizen is left bitterly disappointed. That’s not what I want for you, and I know that’s not what you want for yourself. Now, where do these two amounts come from? Who provides the information to the IRS so that RCP can be determined? An experienced tax lawyer can do this for you. He or she can provide the necessary financial information to the IRS. 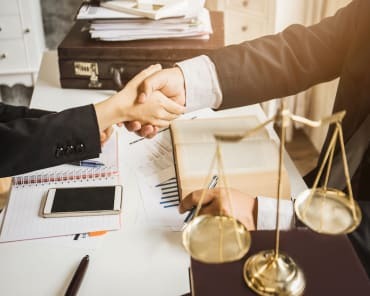 However, before submitting this information, your attorney will deduct expenses and take all necessary and legal steps to minimize the value of assets. Your tax professional will negotiate and attempt to persuade the IRS that the information submitted to the IRS is the true RCP. The goal is to make RCP as low as possible so that you pay as little as possible. You’re attempting to create doubt as to collectability, and this can be accomplished legally and above board by applying what is allowed by the Internal Revenue Manual and by deploying clever financial calculations. It’s vital to seek the help of a tax professional with a proven track record of success. TIP: There is also an offer in compromise based on “doubt as to liability” in which the citizen disputes the tax based on error in law or fact. An offer based on doubt as to liability is a quicker procedure, but frivolous or vague legal claims will fail. RCP is determined by calculating how much income you have left over each month after expenses and adding the net equity value of your assets. Income. How much can you pay the IRS every month from your disposable income? To answer this question, your tax professional will look at paystubs and other income sources. If you are self-employed, your tax attorney will create a financial statement from your business and submit it to the IRS. Expenses. The IRS wants to know monthly living expenses. Expenses such as rent, mortgage payments, utilities, car payments, food, and clothing are allowable living expenses. The allowable living expenses are higher for households with more dependents. Assets. What is your stuff worth? The reality is the IRS is not interested in stuff that cannot be easily liquidated, like clothing and furniture, or even jewelry. As far as assets that may have some liquidation value, there are clever, perfectly legal methods to minimize the value of property. You and your tax lawyer will calculate net income less expenses. You will also calculate net equity in your home, car, household goods, investments, bank accounts, and other property. Net equity is the fair market value of the asset reduced by 20% to arrive at what is known as quick sale value. Any mortgages or bank loans will reduce the quick sale value by the balance owed on the loan. And keep in mind that “fair market value” can be a broad standard and determining what is FMV may be successfully negotiated with the IRS. Declaring Exemptions Is Critically Important. In order to keep RCP as low as possible, it’s vital that your tax professional calculate all property exemptions allowed by the Internal Revenue Manual. The exemptions are allowed on public policy grounds to protect the value of basic necessities and assets necessary to make a living or operate a business. For example, even though tools and machinery may have liquidation value to the IRS, this property may be exempt from calculating RCP because it’s needed to allow the citizen to earn a living and operate a business. Once you calculate RCP, that number will be submitted to the IRS as your offer to settle. When you submit the offer you must choose between paying your offer amount in a lump sum or installment payments. Use Form 656. Thankfully, a lump sum offer is not one payment. Lump sum is defined by the IRS as an offer payable in 5 or fewer monthly installments within 5 or fewer months after the offer is accepted. If you submit a lump sum offer, you must include a nonrefundable payment equal to 20 percent of the offer amount. This payment is required in addition to a $186 application fee. The 20% Down Payment is Nonrefundable. Your down payment will not be returned to you even if the IRS rejects your offer. The 20 percent payment is applied to your tax liability if the offer is rejected, and you can designate what year the payment should be applied to. If You Need More than 5 Months to Pay the Accepted Offer. The IRS allows you to pay an accepted offer in 6 or more monthly installments and within 24 months after the offer is accepted. You will need to include the first proposed installment payment. This payment is required in addition to the $186 application fee. These amounts are nonrefundable. While the IRS is evaluating the offer to pay in installments, you must continue to make the installment payments provided for under the terms of the offer. These amounts are also nonrefundable, but they are applied to the tax liability if your offer is rejected by the IRS. TIP Stay away from companies who operate in other states so that you can meet with a real person face-to-face. The tax resolution industry is filled with scam artists and crooks. You Must Stay Current. You must stay current on filing tax returns and payments for the year that the OIC is submitted and for five years following the IRS’s acceptance. If you violate these terms, the contract is in breach and full payment will be demanded by the IRS. If you would like an experienced tax lawyer to give you a free, detailed analysis to determine what is the best way for you to eliminate your IRS or state tax liablity, call us at 414 771 9200 or toll free 1 800 659 0525.